Quellin (Carprofen) is indicated for the relief of pain and inflammation associated with osteoarthritis and for the control of postoperative pain associated with soft tissue and orthopedic surgeries in dogs. Always provide Client Information Sheet with prescription. Carefully consider the potential benefits and risks of carprofen and other treatment options before deciding to use carprofen. Use the lowest effective dose for the shortest duration consistent with individual response. The recommended dose for oral administration to dogs is 2 mg/lb of body weight daily. The total daily dose may be administered as 2 mg/lb of body weight once daily or divided and administered as 1 mg/lb twice daily. For the control of postoperative pain, administer approximately 2 hours before the procedure. 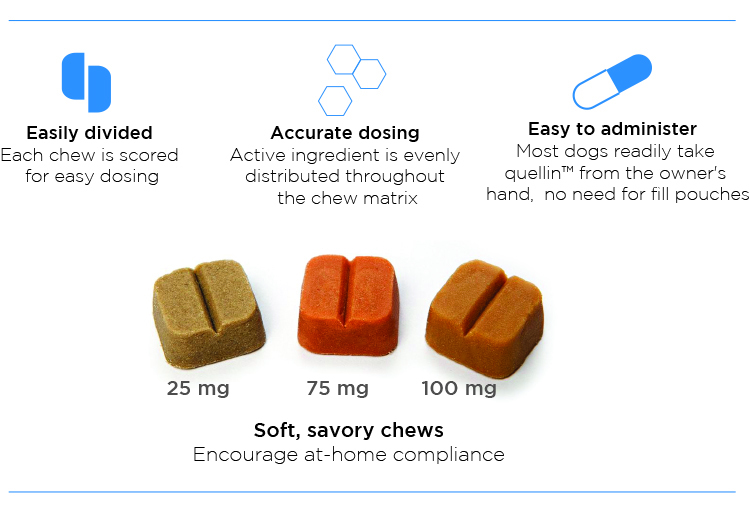 Quellin soft chewable tablets are scored, and dosage should be calculated in half-tablet increments. Soft chewable tablets can be halved by holding the tablet on each side of the score line and pressing up in the middle to break the tablet into two pieces. Care should be taken to ensure that the dog consumes the complete dose. View Quellin Drug Facts Sheet. Effectiveness: Confirmation of the effectiveness of Quellin for the relief of pain and inflammation associated with osteoarthritis, and for the control of postoperative pain associated with soft tissue and orthopedic surgeries, was demonstrated in 5 placebo-controlled, masked studies examining the anti-inflammatory and analgesic effectiveness of carprofen in various breeds of dogs. Separate placebo-controlled, masked, multicenter field studies confirmed the anti-inflammatory and analgesic effectiveness of carprofen caplets when dosing at 2 mg/lb once daily or when divided and administered at 1 mg/lb twice daily. In these 2 field studies, dogs diagnosed with osteoarthritis showed statistically significant overall improvement based on lameness evaluations by the veterinarian and owner observations when administered carprofen at labeled doses. Separate placebo-controlled, masked, multicenter field studies confirmed the effectiveness of carprofen caplets for the control of postoperative pain when dosed at 2 mg/lb once daily in various breeds of dogs. In these studies, dogs presented for ovariohysterectomy, cruciate repair, and aural surgeries were administered carprofen preoperatively and for a maximum of 3 days (soft tissue) or 4 days (orthopedic) postoperatively. In general, dogs administered carprofen showed a statistically significant reduction in pain scores compared to controls. 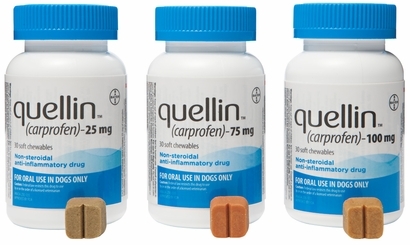 Quellin is a nonsteroidal anti-inflammatory drug (NSAID) that is used to reduce pain and inflammation (soreness) due to osteoarthritis and pain following surgery in dogs. Quellin is a prescription drug for dogs. It is available as a soft chewable tablet and is given to dogs by mouth. Stiffness or decreased movement of joints To control surgical pain (e.g., for surgeries such as spays, ear procedures or orthopedic repairs) your veterinarian may administer quellin before the procedure and recommend that your dog be treated for several days after going home. What kind of results can I expect when my dog is on quellin? While quellin is not a cure for osteoarthritis, it can relieve the pain and inflammation of OA and improve your dog's mobility. Who should not take quellin? How to give quellin to your dog. Quellin should be given according to your veterinarian's instructions. Your veterinarian will tell you what amount of quellin is right for your dog and for how long it should be given. Most dogs will take quellin soft chewable tablets right out of your hand or the soft chewable tablet can be placed on the mouth. Quellin may be given with or without food. What to tell/ask your veterinarian before giving quellin. The signs of OA you have observed for example limping, stiffness). What tests might be done before quellin is prescribed. The risks and benefits of using quellin. 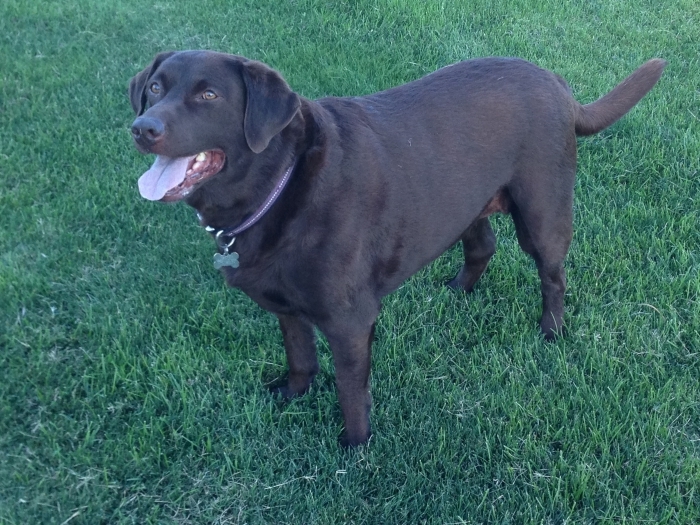 What are the possible side effects that may occur in my dog during quellin therapy? Quellin, like other drugs, may cause some side effects. Serious but rare side effects have been reported in dogs taking NSAIDs, including quellin. Serious side effects can occur with or without warning and in rare situations result in death. It is important to stop therapy and contact your veterinarian immediately if you think your dog veterinarian immediately if you think your dog has a medical problem or side effect from quellin therapy. If you have additional questions about possible side effects, talk to your veterinarian. Can quellin be given with other medicines? Quellin should not be given with other NSAIDs (for example, aspirin, deracoxib, etodolac, firocoxib, meloxicam, tepoxalin) or steroids (for example, cortisone, dexamethasone, prednisone, triamcinolone). What do I do in case my dog eats more than the prescribed amount of quellin? 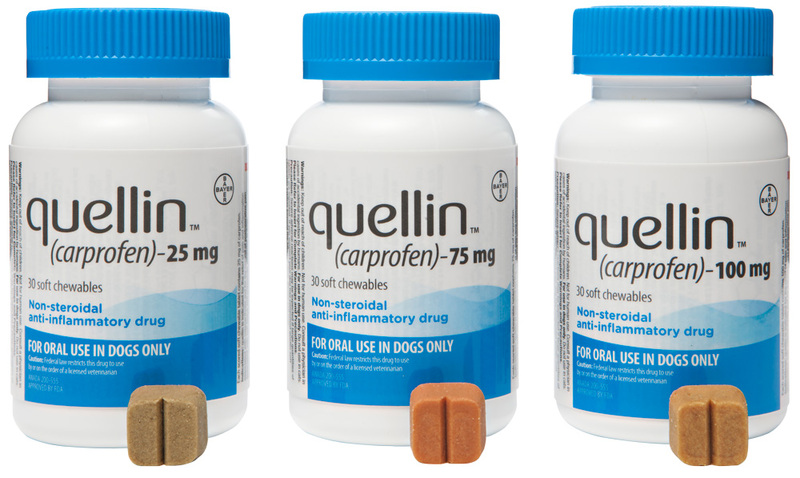 Contact your veterinarian immediately if your dog eats more than the prescribed amount of quellin. My picky boy loves them. Theyâ€™re soft so easy to divide if necessary and apparently tasty. He chews them up immediately. He usually at the Rimadyl chewable tablets but would sometimes spit them out. ConsNo large bottles get several small bottles, take up more room in the cupboard. Bottles need to seal better, the last few get a little dry. Prefer non-childproof caps. No children in the house and the caps can be hard for the feeders with arthritis. 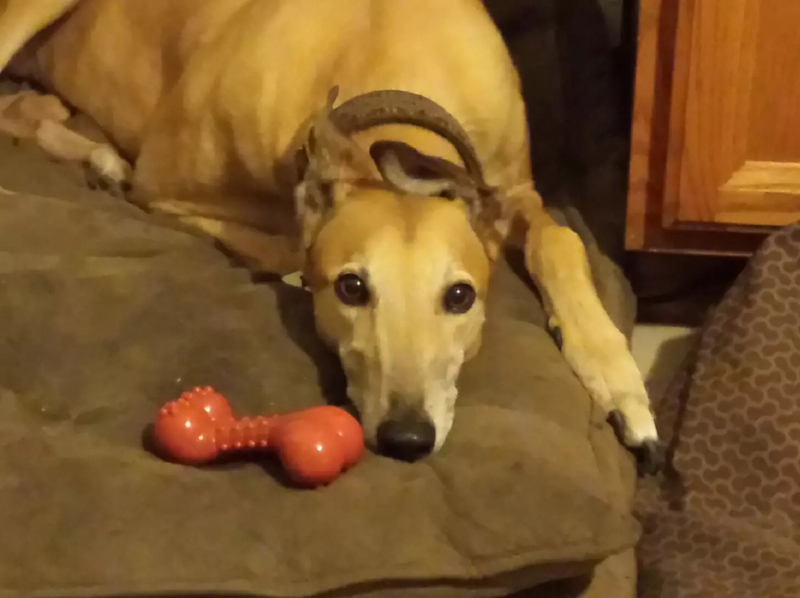 I have a greyhound who is a retired racer. His leg was broken on the track and pinned. When I adopted him, an X-ray was taken which showed arthritis around the pinned area. The vet prescribed Carprofen 75mg twice a day. In the five years since he rescued me, I have tried various Carprofen products. I have found Quellin to work the best. The price was right and Entirely Pets Pharmacy has been great in contacting my vet for refills plus shipping this medication quickly. The reason for the 4 star is although it says "soft chewables", my greyhounds refuses to eat it by itself. It does hide better in his food than caplets, but I do not feed him 12 hours apart. I have to disguise it in a small amount of food. ConsGreyhound does like smell to chew without being hidden in food. My golden retriever has joint issues . I give her 1 per day to alleviate limping. It has been working very well and I will continue to purchase this product to avoid ACL surgery. Unfortunately the carprofen chewables expire in 6 months. I didn't know that and should have purchased way less as I only use 1/4 pill/day, so will have to use them after they expire or waste the extra. ProsI have to cut the chewables into eighths which is impossible with the pill form. This makes it really easy and the dog likes them. I like working with Entirely Pets Pharmacy. This is my first prescription with them and they were great. ConsThe expiration of the chewables really is a problem. Great place to buy meds! They are excellent! Process your order quickly, and it arrives so promptly, I'm amazed! My dog is 12 years ago. He was whining a lot and barely moving around. Limping. About a week after starting the medicine, we noticed that he seemed to feel better; now he's feeling a lot better. Moves around easily. They got the RX from my vet, and promptly sent the order, great service!! Our vet prescribed this medication for our 13 year old dog with arthritic back legs. He could barely walk to the end of our block and looked like he was in pain just getting up and down. Since he's been taking it a couple of months he's back to running up the stairs and walking up hill without hesitation. We've cut back the dosage like the vet suggested and he's still doing well. We didn't notice any side effects, either.